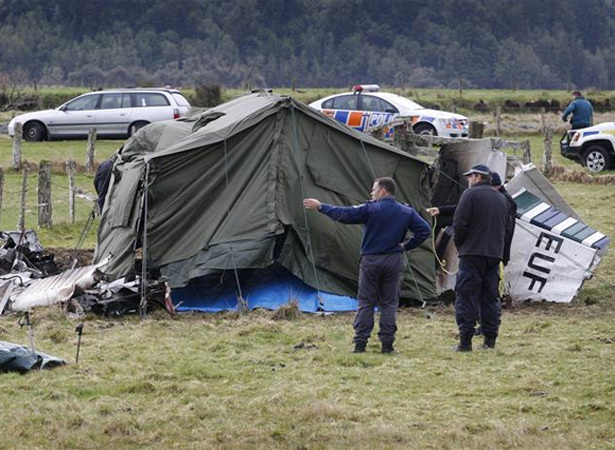 On 4 September 2010 a plane crashed soon after taking off from Fox Glacier airstrip, killing all nine people on board. The Walter Fletcher FU-24 was piloted by 33-year-old Chaminda Senadhira and carried four skydiving instructors (Adam Bennett, Christopher McDonald, Rodney Miller and Michael Suter) and four skydivers who were touring the West Coast on a Kiwi Experience bus trip (Glenn Bourke from Australia, Patrick Byrne from Ireland, Bradley Coker from England and Annika Kirsten from Germany). The plane crashed just metres from the house of the chief officer of Fox Glacier’s volunteer fire brigade, John Sullivan, and caught fire on impact. Sullivan found no signs of life when he arrived at the scene soon after the crash. An investigation by the Transport Accident Investigation Commission (TAIC) found that the converted agricultural plane was unbalanced and overloaded. When it entered service as a parachute drop plane three months earlier, the necessary calculations relating to weight and balance had not been made. Another significant contributing factor was the fact that the plane had become airborne at too low a speed. The pilot was unable to regain control as the plane pitched upwards and rolled to the left before descending almost vertically. Among the TAIC’s six recommendations to the Civil Aviation Authority (CAA) were measures relating to aircraft weight, balance and modification. Following the release of the report Bradley Coker’s father, Chris Coker, called on the government to urgently review aviation regulations. Until this was done, both the New Zealand public and tourists would be ‘highly vulnerable’. The CAA responded that it had made significant changes since the accident. New rules for adventure aviation introduced in November 2011 set higher standards and allowed the CAA to have closer oversight of these activities. We have 9 biographies, 9 articles, related to Fox Glacier plane crash.